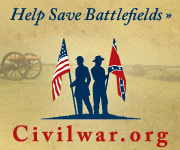 Back when Civil War Trust’s interview with Gary Gallagher first posted, I skimmed through and moved on to other materials. There isn’t much meat there for my taste. I perceive the Trust’s purpose with the interview was to produce an article which would attract readers in the educational profession. And perhaps start thoughts rolling around that would promote discussions in the classrooms. I get it. But I am not a member of that target audience. No harm, or foul. Just to say Gallagher’s words didn’t excite or inspire me. As they were not intended to. CWT: What do you make of the sesquicentennial commemorations so far? Especially compared to the centennial. GG: I think it’s been anemic. I don’t think many states have done much. Virginia’s done a great deal with a series of what they call Signature Conferences. There’s a state agency devoted to the sesquicentennial. They’ve had these conferences at different universities–one on emancipation; one on military affairs; we’re going to do the last one here at the University of Virginia in 2015 on the memory of the war. A book is published from each of the conferences, and there’s a website and various ancillary benefits. So I think Virginia’s done by far the best job of any state. Pennsylvania’s done a little; North Carolina’s done a little. Tennessee’s done a lot more than most. But most states have done absolutely nothing. And I think part of it is that the Civil War still can become very controversial very quickly because you can’t talk about it without talking about race. Or you shouldn’t, because slavery and issues related to slavery are so central to the coming of the war and the conflict itself. And that part of the history of the war can be so fraught, even in 2013, that it’s just easier not to do it. Which I think is too bad. In fact, had a friend not passed along a link to Kevin Levin’s take on this, I’d have been unaware of Gallagher’s assessment of the sesquicentennial. Though I doubt it to be the case, this reads as if Gallagher was caught unprepared. The only way one can even come to the lead “I think it’s been anemic” is to have remained detached from the reality occurring at those 150th events. 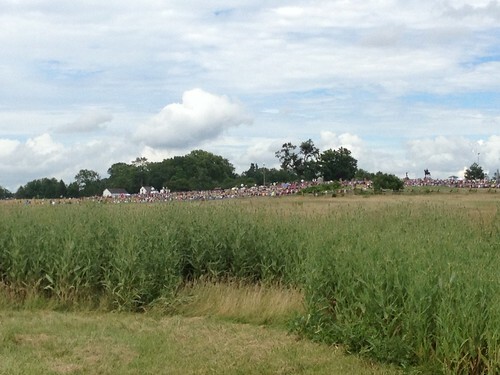 That is the crowd standing on the Federal positions atop Cemetery Ridge, July 3, 2013. JUST the Federal side. Some sources put the totals around 55,000 in that section of the field, and thus rivaling the number of men in that location on the day of the battle. I can’t attest to the accuracy of those numbers. I didn’t make a head count. I just know, from being there at that time, there were a lot… A LOT… of people who shared the experience. Heck, Civil War News passed along the statistic – 900,000 people viewed Facebook updates on Gettysburg’s page during the 150th. So LOTS of people, and not necessarily people AT Gettysburg on those summer days. And don’t let me stop with Gettysburg, which we would assume would draw large crowds. Shiloh’s 150th saw more visitors in a short couple of days than the park normally sees in several months. Look at the attendance at Chickamauga last September. So this is not limited to an “eastern theater” following where so many of the “familiar” battles took place. And beyond that, technology has allowed those not there in person to experience events (as was the case with me on the anniversary of the second assault on Battery Wagner last July). I could, as long time readers will know, fill up this post with dozens and dozens of photos showing the crowds at these 150th events. Some small. Some large. But not anemic. Let’s take that word in the context of “of failing health” or “frailty.” One of the hallmarks of the 150th events is the inclusiveness of the topics interpreted and discussed. Good, healthy, and vibrant discussions. There has been no shying away, as Gallagher alludes to, on the topics of slavery or emancipation (or for good measure southern nationalism and northern unionism). There HAVE been healthy discussions on those topics. IN public, TO the public, WITH the public. And the public has not dismissed or distanced themselves from that discussion. This has brought a refreshing vitality to the 150th that, in my opinion, was just not there even ten years ago. The net result has been activities such as the commemoration of the Rappahannock River Crossing at Cow Ford. You see, these events need not involve thousands of visitors to be “healthy.” Or at least that’s the way I figure.